Bonnie founded RHS 32 years ago. Over the years she has developed an innovative multiple arts-based curriculum, using extended learning projects to teach holistic pre-kindergarten transitional readiness skills. 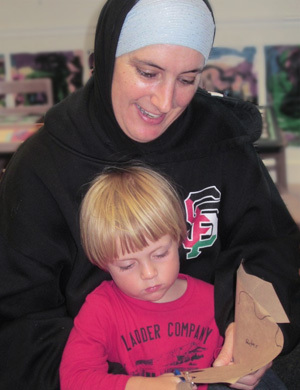 She incorporates the best of the best of early childhood curriculums and techniques into Russian Hill School's open classroom format. Bonnie prides herself on individualizing with each child and is hands-on teaching in the classroom daily! Director McFadden holds an MA in Early Childhood Education and a BA in Education and Fine Art. Our very special head teacher, Lyvette Loyola has been with RHS for well over a decade! An early childhood educator by training, she is a specialist for our unique arts-based, individualized academic curriculum. Working directly with the children and fellow teaching team colleagues, she is a wealth of information regarding child development. Head Teacher Loyola is also a talented mosaic artist. Hend is our very own San Francisco native. She earned her A.A. degree with an emphasis in Early Childhood Education, and has been using her talents & knowledge at RHS since 2008. Also a mother of three, she is well versed with the ranges of child development and brings her experience to the RHS community. Her unique art contributions to the school feature stain glass pieces ranging from four-door screens to hanging installments. As a women of diverse background, Hend is constantly introducing the students and her colleagues to multiple facets of culture through a variety of mediums. Ivonne is originally from the Republic of Suriname in South America. She graduated from the Social Academy in the Netherlands where she studied Child Development. Ivonne worked with children through the Salvation Army as both a child development specialist and a social worker. She then immigrated to the U.S., and spent 18 years working in Early Childhood Development as a head teacher and child care director. Ivonne has been sharing her talents with us since 2006. Stephanie grew up in New England, creating, playing, and expressing herself in her mother’s decorative art studio. She received her BFA from the School of the Museum of Fine Arts at Tufts University. Today her artwork takes the form of painting, drawing, embroidery, miniature book making, and sculpture. For the last three years, she has been teaching private art lessons to children in Boston through her company, Stephanie Rae Private Art Lessons. Since moving to San Francisco in April, she has been teaching and creating with preschoolers at Camp Doodle in Hayes Valley. She is passionate about working in early childhood education, and teaching children about the world through art. Mind Matters, a statewide movement/ campaign to eliminate stigma and discrimination pertaining to mental health. Nathan was born in Germany and grew up in Ridgecrest, CA, a small town in the Mojave Desert. He holds a BA in women’s studies from The University of California at Santa Barbara, a MA in early childhood education from San Francisco State University, and a MS in curriculum and instruction from The University of Texas at Austin. Nathan started at RHS in 2008 and rejoined RHS in the summer of 2013 after moving to Austin for four years. Kate literally grew up in the school. Bonnie is her mom (in case you didn't know!). In high school and college she was TA and then worked as a teacher at RHS after graduating from UCB. Since then Kate has shifted her focus to school operations. She is the Vice President of the RHS Board of Directors. Kate holds a PhD in Clinical Psychology with an emphasis in child and family. Beth comes to us with 20 years of experience working in schools and museums. At RHS, her passion is helping parents and their little ones find the right fit for preschool. She is often seen around San Francisco on a bike, with her seven year old daughter Zoe. Beth has a BA in Political Science and a Teaching Degree for grades 9-12th. She was born and raised in upstate New York. Tamie is a life long learner who came to RHS in 2009 after a career in design and business. In addition to keeping the RHS office running like a dream, she continues to take college classes in ECE and other interesting topics. Tamie helps in the classroom from time to time as she loves children and deeply enjoys teaching. Tamie loves hiking and travel - ask her where she has been! Heather has been with RHS in different capacities for well over fifteen years. For the past ten years she was our Admissions Director and a Special Education Learning Consultant. Heather has an MA in Special Education & Early Childhood Education from San Francisco State and a BS from the University of Vermont in Developmental Psychology and Pre Medical studies. Heather is now our resident yoga teacher, after having completed her 200 hour RYT yoga teacher training at the Mindful Body.